PTEF localizes to multiple cellular compartments. Immunofluorescence assay (IFA) using anti-NTD serum (left) and anti-CTD IgG (right). DAPI was used to stain parasite DNA. Images are representative of five IFA replicates. Scale bars, 5 μm. During ring stages, CTD staining was localized to the cytoplasm of the parasite, whereas late-stage parasites displayed strong fluorescence signals that covered both the parasitic and erythrocytic compartmentsin most IEs, resembling the pattern of full-length GFP fusion transfectants in the live imaging. However, heterogeneous staining was observed for some late-stage IEs, with some showing predominant localization within the parasite compartment, whereas others exhibited preferential staining at the PV/PPM. Despite the lack of a PEXEL motif, the export of the PTEF protein was also observed when using antibodies against the NTD, although a lower erythrocytic-to-parasitic signal ratiowas observed.Chan S, Frasch A, Mandava CS, Ch'ng JH, Quintana MDP, Vesterlund M, Ghorbal M, Joannin N, Franzén O, Lopez-Rubio JJ, Barbieri S, Lanzavecchia A, Sanyal S, Wahlgren M. Regulation of PfEMP1-VAR2CSA translation by a Plasmodium translation-enhancing factor. Nat Microbiol. 2017 May 8;2:17068. PTEF localizes to multiple cellular compartments. a, Direct live imaging on parasites transfected with GFP genes fused with HS (1), NLS (2), NTD (3), CTD (4), full-length PTEF (5) and GFP alone (6). 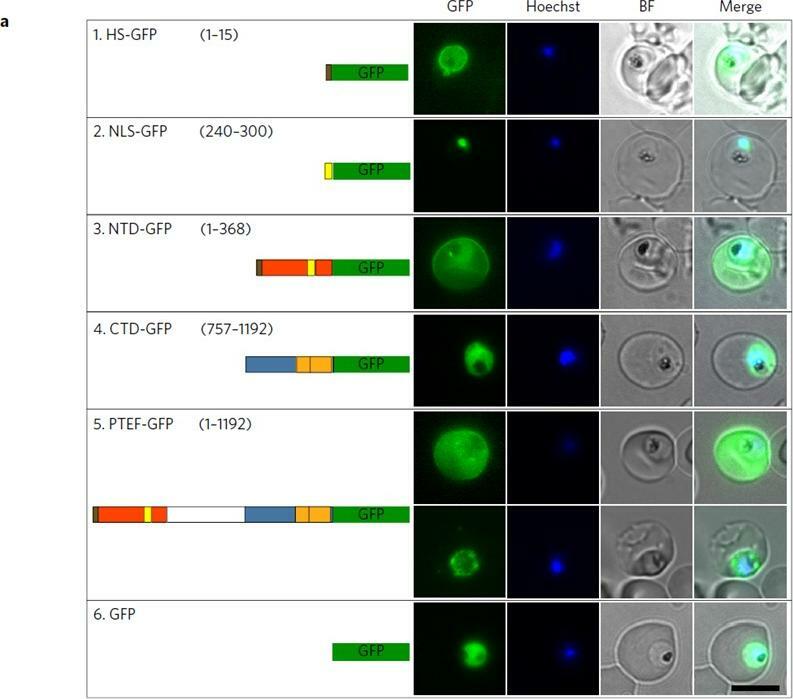 HS-GFP displayed exclusive localization to the parasitophorous vacuole (PV)/parasite plasma membrane (PPM), whereas the NLS-GFP construct faithfully imported GFP into the nucleus. Interestingly, the NLS signal was overridden when present in the whole NTD, resulting in diffuse localization of the NTD-GFP to the PV/PPM as well asto the erythrocyte cytoplasm and membrane. 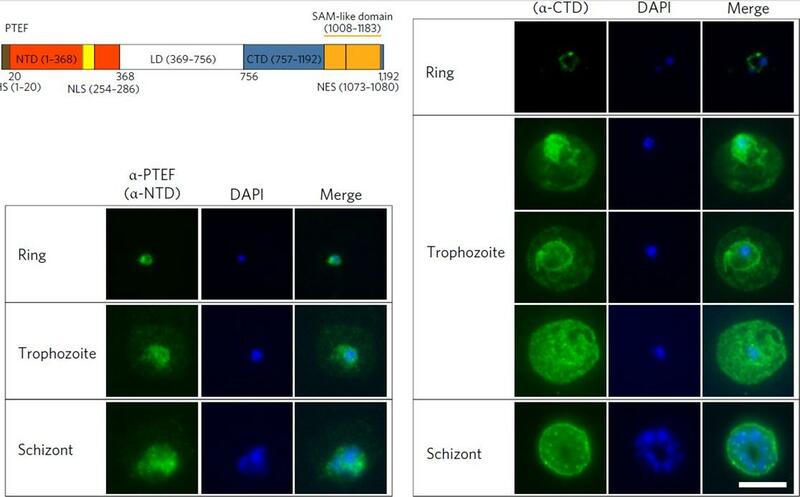 By contrast, CTD-GFP was only found to localize in the parasite cytoplasm. Again, the full-length PTEF-GFP displayed a diffuse pattern in the entire parasite and host erythrocytes, with a small fraction of IEs showing intense localization to the PV/PPM.Chan S, Frasch A, Mandava CS, Ch'ng JH, Quintana MDP, Vesterlund M, Ghorbal M, Joannin N, Franzén O, Lopez-Rubio JJ, Barbieri S, Lanzavecchia A, Sanyal S, Wahlgren M. Regulation of PfEMP1-VAR2CSA translation by a Plasmodium translation-enhancing factor. Nat Microbiol. 2017 May 8;2:17068.